Drumond Park is the UK’s leading independent games company, providing many game titles for both adults and children alike. 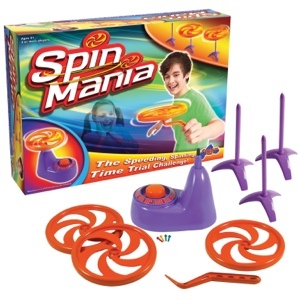 Spin Mania (rrp £22.99) is just one of their exciting latest games to hit the toy shops. I was sent a copy of the game for review. *spin base with timer, * 3 spinning plates, * 3 plate bases, * plate handle and * 4 scoring pegs. The aim of the game is to spin-up three plates one at a time (via the spin base) and carry them on the spin spike to three scattered stands (placed in the play area by your opponents). All three of the plates must still be spinning when player stops the clock on the spinning machine. This game is surely a test of speed and agility. My kids both enjoyed playing this game with few arguments. I have teamed up with Drummond Park to give away a copy of Spin Mania game. To be in with a chance of winning this game you must follow the simple steps below. *1) follow blog button below or top right. One entry per person and must complete all steps. I would love to win this for my grandchildren as they would have hours of hilarious fun playing it! I would love to win this. I have four boys and keeping them entertained is a hard job! I think they would love this, it looks funky and different to what they usually play. Have liked and followed, also tried to tweet but it wouldn’t work :(. Because it looks amazing ! My little girl would love this as she loves watching things spin! It would be great fun to take to Nanny’s House and stop my son vegging in front of the computer. Following and liked on fb and email..Would love to win so my kids can play proper games instead of relying on computers all the time. I would love to win it for my nephew who is autistic, think it would be great to encourage spatial awareness and movement. Far to many kids rely on computer games and technology to play, so its good to introduce fun simple toys. I want to win this game because it looks like a great fun way to spend time with the kids. My son is just getting old enough to play these kinds of games & I would love to win it for him. I have followed all the steps to win this game, because I know that my children would love it. I have borderline personality disorder, so its not often that I have the energy to get up and run around and play with them. They miss out on so much at times, that i would love to be able to give them this, to show them that I do think of them, love them and care for them, more than anything. I’d love to win, think my kids would really enjoy this! I would love this for my boys, so they can play together nicely for once haha! I would love to win this as I have 3 children, and the summer holidays are fast approaching… I have a small list of things to do to occupy them but I just know by the end of the 1st week they will be bored, so the more I can get to keep them busy, the easier my life will be! I have followed your blog and liked on Facebook. I would love to win as this would keep my boys occupied on the rainy days in the summer holidays. I would love to win because this looks like massive fun!! I have 5 kids & I think we’d have a great time!! I am an existing email follower of your blog, and I already like Drumond Park on facebook, their games are brilliant. I would love to play this with my son and have some fun! Following as [email protected]. Liking on facebook as Becci Cleary. I need some toys at my house for when my niece comes to visit! Would love to win this to play it with my grandchildren when they come to stay. This would be great to keep my children and their friends occupied during the school holidays. My friend and I are sharing childcare for a few days in the holidays to save using all our annual leave so this would be great for entertaining them all. My daughter would love this, she loves things like this and since she has been at school I don’t get much time to play with her, this would be so cool.